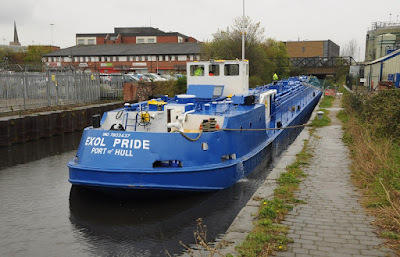 Exol Lubricants has recently added a new barge, "Exol Pride," to its fleet, which will transport raw materials from Hull to its bulk blending plant in Rotherham. Exol is the largest independent lubricants company in the UK and is headquartered in Wednesbury in the West Midlands. The Rotherham site at Northfield Road was formerly known as Greenline Oils and manufactures lubricants from base oil transported from Hull. The new investment means that the company is able to transport approximately 500 tonnes of raw material per barge and Exol believes that by using barge transport, it is able to benefit from a cost-effective, efficient, safe, green and sustainable option, minimising its carbon footprint while transporting large loads. Exol has been a long term user of the waterways, leading the oil and lubricants market by using an environmentally friendly option while transporting large loads on the "Humber Princess." The company has been commended for its reduction in carbon footprint and has even featured in ITV's Barging about Britain, hosted by John Sergeant. Operator, Mainmast have renamed the former tank barge "Humber Pride" as "Exol Pride" and repainted in Exol group livery. It carried its first load in April. The barge is expected to make one or two deliveries a week and thus avoid the use of lorries. The barge journey covers 65 miles and takes between 10-12 hours. This means the whole cargo is delivered more quickly than if the barge crew drove lorries. Furthermore, utilising the figures produced by the Tyndall Centre for Climate Change barges produce only 25% of the emissions of those from lorries. Steve Dunn, sales director at Exol Lubricants, said: "Exol Pride is part of our strategy in aligning the Exol brand with the company’s philosophy of supplying customers with the highest quality product, backed up by market leading support and service." David Lowe, chairman of the Commercial Boat Operators Association, added: "The barge represents 18 heavy goods lorries, use of the barge saves time, avoids pollution from lorry engines and also helps reduce road congestion, particularly on the roads around Exol's Rotherham depot." Where road travel is essential, Exol maintains one of the most economical fleets on UK roads, comprising a mix of dual-purpose vehicles and large tanker trucks to transport both bulk and packaged Exol products to customers across a variety of sectors including agricultural, automotive, industrial, marine and rail. The canalisation of the river Don in the mid 18th century made Rotherham an important inland port, and encouraged the growth of industry, even though the waterway was soon superseded by the railways.